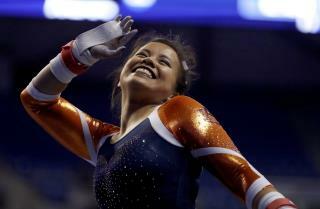 (Newser) – Auburn gymnast Samantha Cerio became an internet sensation earlier this month for all the wrong reasons. The 22-year-old dislocated both knees and suffered major ligament damage when a landing went awry, but she tells NBC's Today show that she's got it all in perspective. "This is a small setback but just another thing to get through," said Cerio, who USA Today notes had surgery last week. Cerio is done with gymnastics, and the aerospace engineering major already has a job lined up with Boeing on rocket design. But before that comes a more personal goal: being able to walk down the aisle for her June wedding. "I'm really stubborn," she said, "and I know I'm going to do everything in my power to make it happen." So she's going to be a software engineer writing software code for boeing?? okkkkkkkkkkk why do I have a badddddd feeling about MY knees?? Hey! Don't LOOK at me.... wait a minute... COMEBACK!! There is a video of a woman doing leg presses on a machine that had the same thing happen. She locked her legs straight but the weight was too much and it bent both her knees backwards.